jksuperstar wrote: The new DSP used here has hardware blocks to support FFT, and I think combining the FFT with the displays might be a real nice, and very unique, feature to have in a interface. Similarly, phase analysis or other tools (440hz signal generator, etc) could be very useful, especially for something with this many channels of I/O. Phase analysis,- you mean correlation meter and/or goniometer ? dante wrote: Limiting and mixing could be good for example ! Limiting, yes,- mixing,- maybe ...How far shall the "mixing" go in a AD/DA unit ? How far depends on application. What Im saying is, think from an application point of view - not just what can run on a DSP or whats appropriate on an IO box. 'How Far' - in my scenario - would be whatever is needed to do the gig and make up for gears not there due to circumstance. For example, I imagine at a concert hall with only 24 SM58's - that you wont do EQ in that box - you would rely 'on the room' and mic placement. But you would need limiting and a very basic mixer (just to mix levels, no inserts or send FX) in order to get a stereo mix from 24 mics, and maybe just master bus comp and yes maybe phase correlation meter to help mic placement. I mean, you dont need reverb because your already in a hall isnt it ? Last edited by dante on Mon Apr 13, 2015 2:48 pm, edited 3 times in total. I think I once went to a proctologist who had one of them goniometers. I left. He he. Yes, phase correlation! Yes, to any tools that are useful for an AD/DA....one "mixer" solution might be a headphone/cue output, with selectable MUTE or SOLO, to listen to channels or groups of them. Or defining send/return I/O routes that act like an insert to others. For example, I imagine at a concert hall with only 24 SM58's - that you wont do EQ in that box - you would rely 'on the room' and mic placement. But you would need limiting and a very basic mixer (just to mix levels, no inserts or send FX) in order to get a stereo mix from 24 mics, and maybe just master bus comp and yes maybe phase correlation meter to help mic placement. All good, but there´s no word about whether you think of using it standalone or not. When connected p.ex. to PCI cards and/or XITE, you´d have the buss, the buss compressor as well as the stereo master in the SCOPE environment, in fact a full featured mixer which doesn´t force you to use aux FX and/or insert FX,- but you can if you want. If the machine works standalone, I agree on the submix- and bussing/summing- features though. dante wrote: I mean, you dont need reverb because your already in a hall isnt it ? No reverb, no phazor, flanger, chorus, pitch shift, fuzz, OD or ringmod,- and no bit crusher too ! ronnie wrote: I think I once went to a proctologist who had one of them goniometers. I left. Yup. I figured limiting was better than mixing. I for one can use this A32 right away. The Behringer X32 Rack is proving to be a great partner w/ Scope XITE-1 but the Xbox is limited with it's I/O so this is most welcome. I'd much prefer using the A32 for bringing in high quality FX like the TC Fireworx. but not as good as the original A16 or the MKII. I would love using the A32 to replace the X32 Card as well as the Behringer converter, and add more FIreworx. As far as Scope extras how about a great mixer something similar to SpaceF or RoyT where true stereo AUXs are used. It makes a lot of difference in the FX. On the STM 1632 X and STM 2448 X you can barely hear the FX until 75% of the AUX is cranked up, and then the slightest movement is a huge jump in wetness. On a SpaceF or RoyT stereo AUX Mixer it is an even send strength throughout the entire range. I suppose the scientific term is more headroom, but the FX are stereo FX. Perhaps this is why on Optimus Prime and other great stereo FX we have, I always have to listen with bypass on/off and adjust or invert the phase since it's a mono send...??? Dunno, just tinkin' out loud. If I could get that implemented I would be eternally grateful. Phase compensation and all of that stuff seems like such a petty chore for a SHARC. RME has Total Mix, which is a step in the right direction. But a true 8 BUS, 8 AUX 32 channel mixer would be something I would pay additional money for. 3 large for the package is what I would pay. Then Scope XITE-1 can be my giant BC Modular 32bit MIDI Death machine, fully integrated into a DAW. What connectors would be used for the analog out ports on the back of the A32? I guess it'll be the Tascam/Digidesign DB25 connectors. 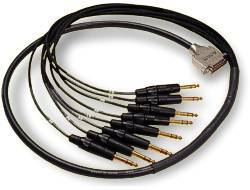 Seems there are two standards for this AES59-format cable, differing in the pinouts only. Congratulation Juergen. A very nice product! dante wrote: With only one DSP, can't imagine turning it into any sort of multiFX unit. I can't see why not. That single DSP equals a Scope PCI card in performance on optimized code. UAD gets a lot out of an ADSP-21369. I bet Juergen could turn this beautiful Collie into a Rottweiler. JuergenK wrote: What I can say is that for extra spice we put the newest Sharc inside to give parts of the Scope Library a new home! Still good for submixes that can mix 32 channels down to a lesser number suitable say for XITE-1 ADAT. dante wrote: = clock gains only. I don't think I understand what you're trying to imply. That 2.7Gflops can only add 32 channels together (which equals to 5952K flops at 192Khz)? Last edited by Warp69 on Wed Apr 15, 2015 11:11 pm, edited 1 time in total. From recollection, it was you that bought to my attention that Scope library (referred to by Juegen) wasn't optimized for the XITE chip (21369) - and the chip shown in his post is an even later version (21489). So puzzles me how the code will be optimised - Im missing something here. It's correct that the old Scope DSP modules is far from optimized for the new sharcs, but I would hope that Scope 6 will rectify this (it has been underway for some time now). What is unknown is how much power is available for DSP effects/function - the antialiasing filters are probably also running on the 21489. Ok Scope 6 - cool. So if he implements something using current Scope library, he can still release an update later coded on Scope 6. Until then though, anything I suggest will be based on current Scope, which seems to be the brief. RME users are nothing but satisfied with Total Mix FX, which really was a Scope strength for us all of these years. Another big advantage is the Modular community. I sure hope they can continue to at least support the Mixing, FX and Modular categories, while adding expansion options. ADAT is still considered a great protocol, MADI and the AES50 Behringer is incorporating should be looked at too. Anything is a PLUS for me, as having an XITE-1 as a mixing/sound card option is a luxury I cannot perform without. Good to know RME could cover me as a last resort, but Scope 6 seems really important, more so than ever now.